How many times has Google called you out of the blue to chat about your business? If you answered any number except “zero,” then its 99.9999% sure that you were not actually talking to the a Google representative, but rather were a target of telemarketers. Unrequested Google telemarketing calls simply do not exist. Anyone claiming otherwise in a call to you is misrepresenting themselves. Google is notoriously reticent about calling businesses. When they do call, it’s because you’ve asked them to make the call. Those calls are mostly automated voice or text to provide PINs for account setup, login 2-step verification, Google Places listing verification, etc. A Google representative may call your business if you’re a Google AdWords user. Other than that, Google won’t pick up the phone to call you unless you request the call. They also make it extremely difficult to reach a person when you call them for support with their products. 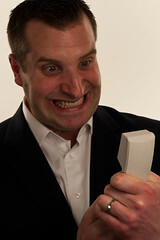 Tired of getting telemarkeing calls at your business? Do something about it. We keep getting calls from someone saying they are Google and that they are calling to help us get our Google Places listing. They keep calling us over and over again. I typed ‘Google places placement service’ into Google and your company’s website came up, so I thought it might be you. I explained that it most certainly was not us calling, but it certainly was a solicitation. I commended her on her skepticism about it actually being Google making these calls. I then advised her that if she wanted to avoid calls like this she should make sure her business was listed in the National Do Not Call Registry and, if she continued to receive calls after a month of registering, to file a complaint with the registry. If you ever receive a call, automated or live, meeting any of the above descriptors just know that you’re not on the line with a Google telemarketing representative. If they claim they are from or have a special partnership with Google they’re lying (i.e. it’s a scam) and that’s no way to start a relationship with a service provider. If you are an InsideOut Solutions client who would like help with Google maps, places, Google+ or other Google products from a provider who doesn’t pretend to be something it’s not, contact us. Login to your Google account, go to your security settings and review recent activity to see if there has been any unauthorized activity. If you believe your account has been compromised, Google offers a Gmail security checklist. Forward the SMS message to your mobile phone service provider’s spam reporting number. Google policy is clear: they don’t guarantee top placement for organic search results. Guaranteeing top placement for search results for all Google users at all times is impossible. Like the DNSservice.com “invoice” deceptive advertising I wrote about, there are unscrupulous types out there using Google’s name in solicitations that look like an invoice for services such as Google Maps or search results placement. Always read anything you receive that looks like an invoice very carefully. Be skeptical even if it does not state that it is a solicitation. Check your records for previous payments to the sender and, even then, be critical – is this really a service you are receiving and benefiting from? You can review all known fraudulent activities noted by Google at the avoid and report Google scams page. Have You Been Harassed or Even Stung by Telemarketers Posing as Google? Let us know your experiences with and solutions to the predatory telemarketing efforts of companies who try to deceive by claiming to be from or partnered with Google.